Double cleansing has a real buzz about it at the moment, with lots of products designed to clean the day off your face in two stages. One of the reasons I created our original Rose Geranium and Apricot Cleansing oil was because I hadn’t been able to find anything which cleaned my skin properly and left it feeling comfortable in one easy sweep. 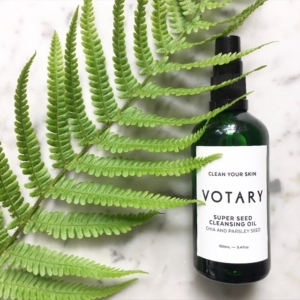 With Votary pure plant cleansing oils you can take it all off first time as part of a simple, easy, uplifting skincare routine. 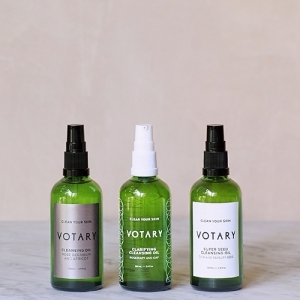 Votary pure plant oil cleansers work in a different way to water or chemical-based cleansers. Plant oils actively dissolve and lift away grime without drying your skin out, so they leave it not just beautifully clean but plumped-up, soft and supple. Jojoba oil – which is one of the hero ingredients in our original cleanser – is brilliant at literally ‘grabbing’ and whisking away dirt from the skin. The Votary cleansing ritual was designed so that you can be confident that every scrap of the day can be removed in one simple routine. Firstly, the oils dissolve everything you want to remove from your skin. Then, the warm face cloth – held to your face – encourages your pores to open to release excess sebum and grime and to absorb all the antioxidant and vitamin rich goodness contained in our formulas. Finally, the mechanical action of wiping away the product gently exfoliates any dull or dead skin, giving you extra glow. You only have to look at the face cloth after you’ve used it to see that everything has been removed – even mascara or thick SPF. I double cleanse once or twice a week for an at-home mini-facial. The first cleanse takes everything off, so that my skin is beautifully clean, soft and completely make-up free. The second time I focus on giving my skin some extra love. I spend five minutes massaging the cleansing oil in really deeply, so that my skin is luxuriously softened and nourished. I take time to enjoy the aromatherapeutic fragrance and let it calm and soothe me. If my skin has had a challenging week, I’ll layer the cleanser onto my skin and let it soak in while I bath or shower. I love the way my skin feels after it’s been drenched in all that pure plant goodness. I think life is so busy and fast-paced, and we’re all always juggling so many different demands, and I want to be able to trust the products that I use and to know that they work to get the job done. 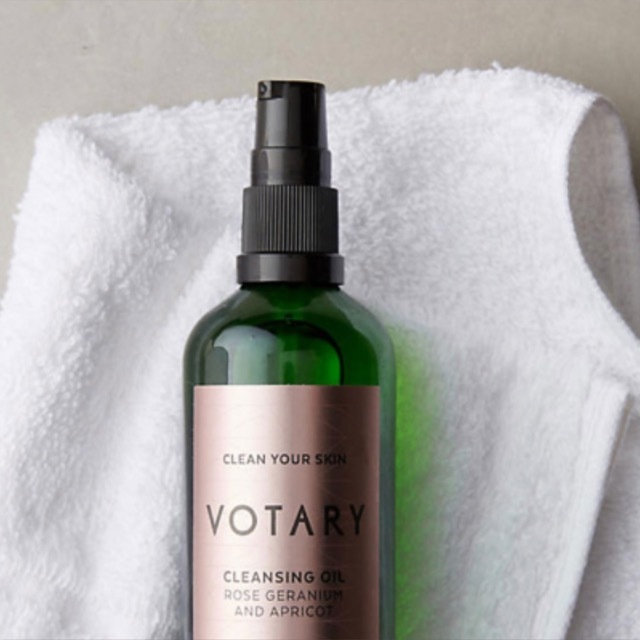 I love knowing that Votary Cleansing Oils #takeitalloff in one go, and that my skin feels deep-down clean, healthy and supple without double cleansing. Read here for how Jess Glynne used Votary original cult cleansing oil at the Brits 2019 to #takeitalloff. Read here and here for why plant oils are so good for your skin. Read here for a master class in oil cleansing. Read here to help you decide which cleansing oil is right for you.